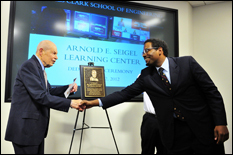 On October 12, 2012 the University of Maryland’s Clark School of Engineering held a dedication ceremony to inaugurate the Arnold E. Seigel Learning Center, a new suite of studio classrooms located in J.M. Patterson Building designed to use cutting edge technology and best practices in online learning to deliver high quality, blended education both face to face and at a distance. The six classrooms, ranging in capacity from 17 to 122 seats, are equipped with state-of-the-art lighting, acoustics, high definition cameras, and sophisticated lecture capture software that both stream live and record a classroom in session. Instructors are provided with a spacious workstation that includes a computer, overhead document camera, touch screen room controls, and an electronic tablet for drawing and/or annotating. 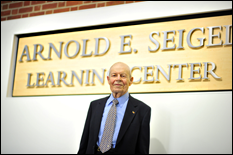 < p> The vision for the Arnold E. Seigel Learning Center began in the 1970s when Dr. Arnold Seigel, who had been teaching engineering at the university part time and was convinced that distance education for engineering students could be as authentic and rich as face-to-face education, began the Instructional Television Unit (ITV). In the fall of 1980, ITV began operations as a two-channel black-and-white television system, using a 40 foot tower installed on top of the Centerville Hall dormitory to broadcast. Over the next two decades, ITV operations expanded to include various locations around the state such as Hagerstown, Annapolis, and Baltimore. Over the last decade, ITV has shifted away from television towards a digital delivery mode and has evolved into DETS, or Distance Education Technology and Services. Today, DETS offers more than 500 students per semester worldwide the opportunity to earn advanced degrees in subjects such as Sustainable Energy Engineering and Project Management. The dedication ceremony, held in one of the studio classrooms in 3201 J.M. Patterson, featured remarks by Jim Zahniser, Executive Director of Engineering Information Technology, Marty Ronning, Assistant Director of DETS, faculty member John Cable, Director of Project Management Center for Excellence, and Dean Darryl Pines of the A. James Clark School of Engineering. Notable attendees included former University of Maryland President, University System of Maryland Chancellor—and one-time ITV instructor—William ‘Brit’ Kirwan and previous Clark School Dean Dr. Herb Rabin and Dean Dr. George Dieter.